Purchased in late 2011, this executive townhome has been completely transformed (selling now due to job transfer). 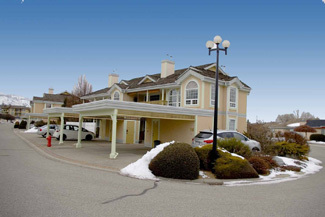 Absolutely unique corner location in prestigious Fairway Village overlooking the Penticton golf course. 2 bedrooms, 2 bathrooms with generous room sizes for a total of 1570 sq.ft. New cherry hardwood flooring in the living room, dining room and staircase. Modern cork flooring in the kitchen, adjoining family room, walk-in pantry. Updated light fixtures and window coverings. New fridge and dishwasher. Professionally painted throughout with modern designer colours. 20' covered west-facing deck off the kitchen with gas BBQ outlet. The ensuite has been completely renovated with new tile shower, soaker tub and quality fixtures. Enclosed north-facing deck makes a perfect office space. Usable attic space with drop-down ladder provides tons of storage. Central air, built-in vac, single carport with storage unit and second parking space. Reno receipts available.